Gracie Folds, Ben’s daughter, has a fledgling music career of her own and a five-song EP album to show for it. 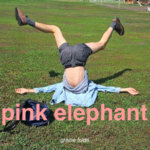 Released in August, the EP titled Pink Elephant features five songs that are very reminiscent of dad’s early material. Unusual rhythms, wryly cynical lyrics and discordant runs and chords run throughout the melodies, described by one commenter as Bach meets Aimee Mann. She plays piano and guitar and Ben contributes hand claps. The album is available on Bandcamp for whatever you’d care to pay for it, and as a bonus, she’ll be the opening act at Ben’s shows in New Haven, Conn., Northampton, Mass., and Burlington, Vt., and possibly more, this fall. Posted in: Ben's Friends and Relations.